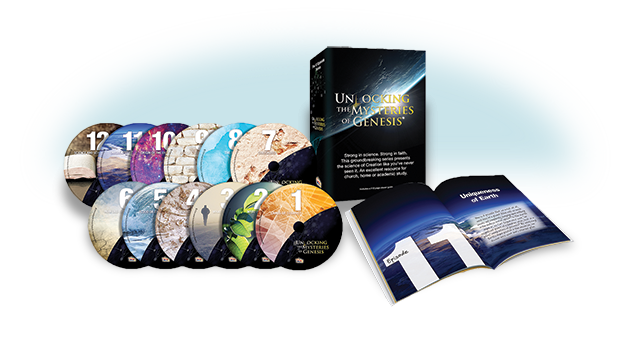 Unlocking the Mysteries of Genesis is a groundbreaking 12-episode DVD series that explores scientific evidence that confirms the biblical account of creation. Perfect for Sunday and evening classes and small groups, each 22-minute episode takes viewers of all ages on a memorable journey through some of the most fascinating topics in creation science. This faith-affirming series includes a viewer guide that makes it easy for non-scientists, including pastors, youth leaders, parents, homeschoolers, and others, to facilitate an informed discussion about creation science and equip viewers with defensible answers to some of the most provocative and controversial questions of faith and science. “This video series is very well done, and I highly recommend it to anyone looking to strengthen their own faith for creation, or to use as a teaching tool. “What a fantastic DVD series! Totally explains any questions that evolutionists could try and debate. Captivating. “The photography is phenomenal! The truths presented in this series makes us more keenly aware of our Biblical roots and the fact we DO have a Creator--God Himself.